02-Apr-2005 -- 'Goto' means 'five islands' which are, from the north, Nakadori-jima, Wakamatsu-jima, Naru-shima, Hisaka-jima andFukue-jima. I live in Fukue-jima for these 2 years as a teacher. People here are very kind, warm and good-hearted. Children are artless. Life here is very simple and traditional. One of my friends told me about this degree confluence project, and I've found the 33N 129E confluence is not so far from here. I had tried several times to get there on my sailboat but I couldn't. As Fabrice Blocteur I also suffered from too hard wind for my boat. 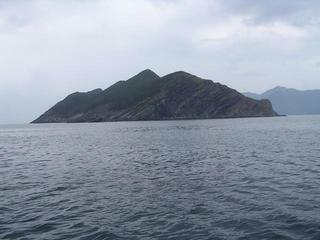 Goto retto islands open to the East China Sea, and in the winter time there usually are strong northern seasonal winds. Last Saturday, 02-Apr-2005, there was no wind and cloudy. I got up very early and started to sail to the confluence. After a while there comes a flat calm. So I started the engine and went on going. When I arrived there, it started raining. I sailed carefully with the GPS then I got 33.00.00 N,129.00.00 E on it within 8 meters. I took some photos in a hurry. On my way home, still dead calm, my boat's engine had troubled with cooling water pump. She drifted for a few hours and I fixed it. Then it started again but I thought I couldn't go back to my homeport during the daytime. So I dropped in to the Naru-shima island which is the center of the five islands. On the next day, it was very windy and wavy. To make the matter worse, there was against current to me. It was very hard sailing. In the water, about 500 m from land.